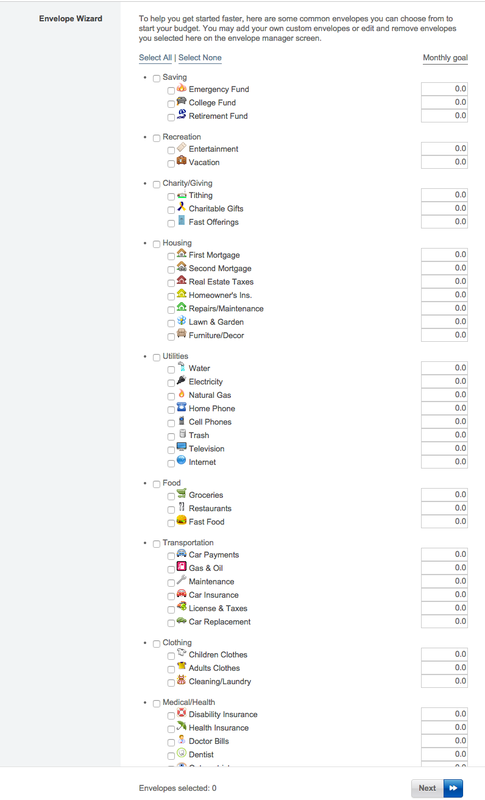 To help you get started faster and to help you remember areas in which you might commonly spend money, we have a list of frequently created envelope categories with icons. You are free to any of them, or you can select none of them and do your own thing. For each envelope you can set a monthly goal amount. This is helpful when you are allocating income. Let’s say you have a goal to put $100 in your Savings envelope every month and you get paid bi-weekly. Your first pay check you may allocate $50. You second paycheck you can see you need to allocated another $50 to meet your monthly goal. Now let’s say it is one of those nice months where you get three paychecks. On your third you can see that you have already met your monthly goal so you choose to put that $50 somewhere else.